This Moorish style palace is two kilometres from the centre of the town. The interior of this palace makes use of polished marble for the flooring with painted tiling, arches, warm dark wood and many potted plants. The bedrooms are cheerful and light with the decoration in pastel shades. The spacious garden contains many specimen trees, the large swimming pool and a tennis court. 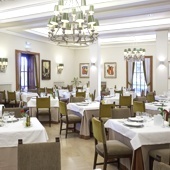 As is customary in the Parador Group, the restaurant combines international dishes with the specialties of the region. 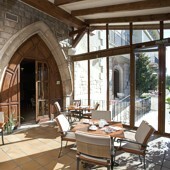 The Parador of Teruel also has a special menu containing gluten free dishes. For a wine to accompany the meal, the full bloodied red wine, Carinena tinto, has been suggested. The town is known as the city of the famous lovers. Apparently in 1217, Diego Marcilla was hoping to marry his childhood sweetheart, Isabel. Unfortunately, over the years, Diego's family had lost their money while Isabel's family had grown very wealthy. Saber's father would only agree to the marriage if Diego went away for five years and came back a successful man. After that time, Diego did not come back and Isabel's father arranged for her to be married to someone else. The day after this wedding. Diego returned for his bride. His grief was so great that he died at her feet. At the funeral, Isabel knelt in prayer before his coffin and also died. Their tombs are side by side in the church of San Pedro and their skeletons can be seen through grills in the mausoleum. The Parador Teruel has forty two twin bedded rooms, eleven rooms with a double bed, six suites and one easy access room. All the rooms have a private bathroom, satellite television, TV canal plus, safe, mini bar and air conditioned. The dining room has air conditioning and the rest of the hotel has central heating. Other facilities include currency exchange, lift, free internet access in communal areas, garage and parking (without security and limited places), piped music, restaurant, satellite television and telephone. 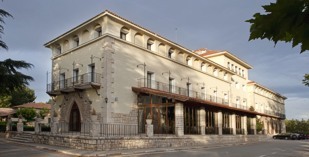 The Teruel Parador also has a bar, garden, seasonal swimming pool and tennis court. Facilities for business meetings and for disabled guests are also available. Distance from the nearest airport is approximately 165 kms, train station is 2 kms away and the nearest port is 150 kms away. Ons verblijf in de Parador van Tereul was zeer aangenaam. Vriendelijke ontvangst, fijne kamer, lekker avondeten met attente bediening, ontbijt zoals wij graag hebben. Ook bij het vertrek was het personeel aan de receptie zeer vriendelijk. We were travelling from north to south to Caravaca de la Cruz, and we spent one night in this Parador. Reception staff was friendly and dedicated to inform us. The room was big enough and confortable with a view to the landscape. It is not very well located to visit the city of Teruel where it is difficult to park. We enjoy the swimming pool after visiting the city. We take our dinner at the hotel, the menu was well prepared, with an entrées and desserts buffets. Breakfast is a buffet with a large choice of food. We stayed at the Teruel Parador in September this year. The welcome we received was warm and friendly. Our room was immaculate; it overlooked the car park area at the front of the building but we could hear absolutely no noise from the main road. We swam in the outdoor pool, which, at 1830 hrs still had a lifeguard on duty. Again, the grounds and pool were immaculate. We ate at the restaurant that evening. The dining room was simple in design, and, thankfully, there was no intrusive music playing. The staff immediately found an English menu for us, and we ordered a meal. It arrived quickly and we found it freshly cooked and really delicious - fish for me, which was exceptionally good. We slept well, and had breakfast before we left. Again, breakfast was excellent and the staff cheerful and attentive. We hope to visit again: this was an amazing tranquil location. Ligging en hotel was goed . Personeel onvriendelijk. Avondeten matig. Ontbijt heel goed. Parador de Teruel is a hotel in a small Moorish style Palace.